We had left to go hiking on one of the frozen lakes in Harriman, as it had been very cold the last several weeks. For some strange reason the lakes were posted as unsafe for walking on. This is very strange as it had been below freezing for a long time. My guess is that the park rangers were just lazy. In any case, we had to do a different route instead of hiking one of the lakes. We first drove to Lake Welch, then Skanatati/Askoti, then Lake Tiorati, and after all these were posted as unsafe, we turned around in disappointment and headed past Lake Kanauwake to Tom Jone Mountain. This is not a long hike but is a nice short climb with a gorgeous view at the summit. Although the sun was out, the weather was very frigid in the 20's. And the wind blew strongly on top of the mountain, making this a very cold hike. Parked on County Route 106, and climbed up the mountain on the Dunderberg Trail. It was a clear and crisp day with excellent visibilty, and we were even able to get some pictures well north into the Catskills. Continued down the mountain on the Dunderberg Trail, where we discovered a fascinating natural "icicle-house" formed over a rock overhang, and continued along to the Victory Trail. Went north on the Victory Trail back to the road, and hiked along the road east back to our car. Along the road is a small swamp, and interestingly there are beavers in this swamp as evidenced by the downed trees, beaver huts, and a beaver dam. The Catskills in the far north. This is over 50 miles to the north! The shelter on Tom Jones Mnt. The lake behind is L. Skenonto. The arm of Lake Sebago in the far distance. 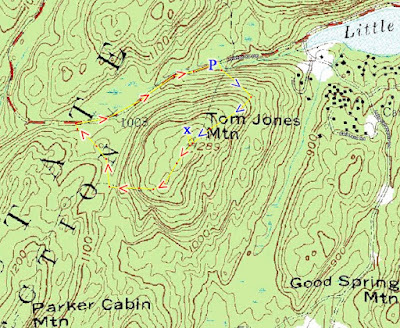 A group of people ascending Tom Jones.